Start off the New Year with the 8th ANNUAL ORIGINAL JOE SINNOTT INKING CHALLENGE! The Inkwell Awards invites you to the eighth annual Joe Sinnott Inking Challenge. With his approval and support, we have taken a couple of his pencil art fundraising donations and converted them to bluelines for inking. 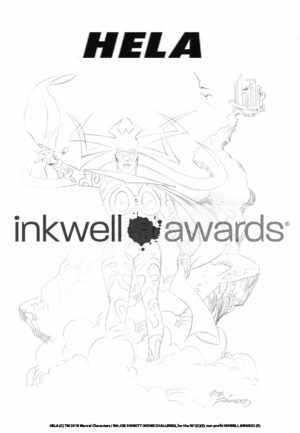 We’ve chosen ink artists who are A) part of our organization, B) Inkwell-Award recipients, or C) notable for their career inkwork, but any inker can take part, including novices. Some of you who missed previous Challenges asked to be added to the list and you are included here. —Expenses for our live awards ceremony every June at Heroes Con, such as purchasing winners’ trophies, flights for award recipients, etc. ALL PROCEEDS RAISED go 100% to the non-profit and the only members paid for any services are legal, accounting and spokesmodels, as needed. NO Inkwell Committee Members or Volunteers have EVER received payment for their services. If you are interested in contributing please REPLY back to myself <dmralmond@gmail.com> and senior contributor Tom Schloendorn <tom_schloendorna4@comcast.net> to confirm that you have the tools/capabilities to print up a hi-res blueline file on 11×17 2-ply Strathmore vellum board to ship back to me and we will promptly email you the hi-res file of either one or both images– please specify WHICH attached character you want. Files will usually be emailed within 24 hours of requests. (THE SAMPLES BELOW ARE LO-RES SIMPLY FOR REFERENCE ONLY). If you don’t have the printing capabilities and are an established, published professional but you’d like us to ship either or both pages of bluelined boards to you, please forward your shipping address to us in your reply. ONCE YOU ARE FINISHED, PLEASE EMAIL ME A 300dpi SCAN OF YOUR WORK BEFORE SHIPPING THE PAGE if you want to be included in any subsequent book collections. If you cannot participate we totally understand about your busy schedules and lives making it a challenge but PLEASE LMK ASAP, REGARDLESS (if we do this again, we’d probably touch base with you again…BUT NOT IF YOU DIDN’T RESPOND). 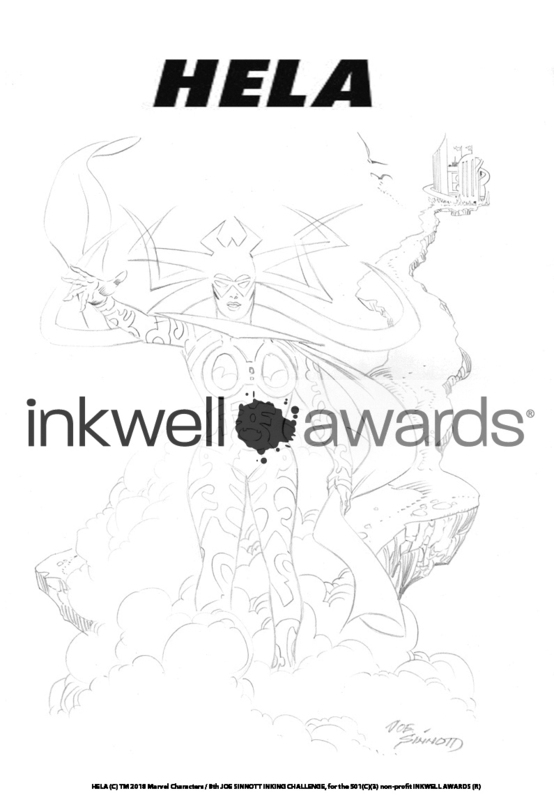 Should you know of another notable inker willing to participate, please pass on their email address so we can invite them; however, we have the right to not include a request and please be aware that no work is guaranteed to be included in our subsequent book collection. But to be eligible for the book you MUST send us a 300ppi hi-res scan at full size upon completion and before shipping. We will be following-up with friendly reminders prior to the deadline. 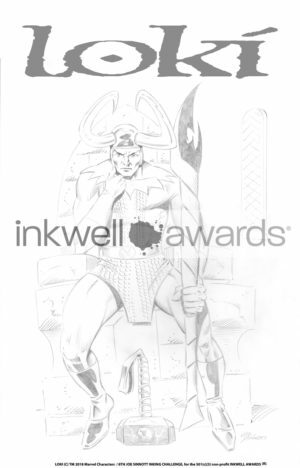 SPECIFIC INKING NOTES: You can ink it ‘as is’ or reinterpret it, bringing something extra to the table….this year we will have a tightly-drawn LOKI and a loosely-drawn HELA. You are encouraged to ink the logos to motivate more auction bids but you don’t have to.